It is not very often that I get the chance to review re-issued classics so I must say thank you to W&N Publishers for sending me copies of two of Nigel Balchin’s classics. 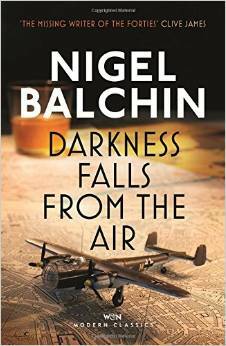 The first book Darkness Falls from the Air was first published in 1942 and is set in London during the blitz at first hand as the bombs where still falling at the time Nigel Balchin was writing this novel. It is centred on Bill Sarratt who is a civil servant and his failing marriage to Marcia to Stephen who can only be described as a bit of a cad and literary poseur, and there is more to this when you add Stephen’s wife Peggy into the mix. All sounds very messy at a time when people never knew wheat tomorrow was going to bring. Bill is struggling with the utter bureaucracy that he feels is hampering the war effort and is constantly fighting this and his superiors to bring change, this is a daily battle he faces as well as the air raids that bring death and destruction to London and other parts of the UK. Balchin’s inside knowledge at this time makes this even more of an interesting read as the strict censorship that was in place during the war years and makes the reader surprised that he managed to write a novel detailing the ‘failings’ of Whitehall bureaucrats. The fact the Bill is also somewhat complicit in the failings of his marriage, yet with relevant parties regularly meeting to discuss what is going on, as the book progresses it is inevitable that eventually this would bubble to the surface and in the end it does. Sadly the ending is a tragic one I had a sense that it was heading that way. The one aspect that I found interesting through this is of how London’s social scene carried on while the bombs fell, I for one would donning my tin hat and running the air raid shelter, but some sought solace in the local pubs and clubs and some ventured out to witness the bombs falling. I am not sure that a book like this could have been written years later as this really was a first-hand account as the bombs rained down on London. The Small Back Room was first published in 1943 and even managed to hit the silver screen in 1949 staring such names as Jack Hawkins, Sid James and even the band leader Ted Heath appeared. Set in World War weapons Scientist Sammy Rice, is one of the team of ‘Back Room boys’ looking at and testing new weapons to help the war effort. Sammy has a severe disability and is somewhat disillusioned with his lot it seriously hampers his professional life and more and more his personal life with Susan who he refuses to Marry. Sammy has to deal with the complexities of his daily professional life surrounded by boffins, designers and the pointless internal politics that goes with this profession, and not to mention the military upper echelons oh and there is a war to win. The Germans has designed a pretty nasty new weapon an anti-personnel mine that explodes when approached killing anyone who approaches it. The ending to The Small Back Room is nail biting stuff as Sammy comes face to face with one of the deadly anti-personnel mines and has the job of defusing it, this part of the book I could not leave, the accounts is just gripping and Sammy has defuse the weapon, something that is incredibly difficult with his disability and how he manages the situation. It is a thrilling end to a book that I would happily recommend The Small Back Room to anyone who enjoys this genre. It is worth it for the end game of the book. 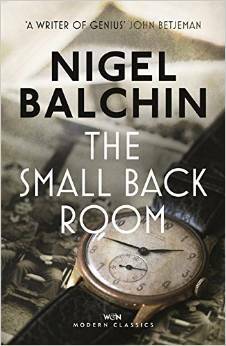 A classic from Nigel Balchin. He was born Nigel Marlin Balchin in Potterne, Wiltshire, to William and Ada Balchin. He was educated at Dauntsey’s School andPeterhouse, Cambridge, where he took a scholarship and became a Prizeman in Natural Sciences. He then worked for the National Institute of Industrial Psychology between 1930 and 1935, becoming a consultant to JS Rowntree & Sons, where he was intimately involved in the design and marketing of Black Magic chocolates. And, he claimed, responsible for the success of the Aero and Kit Kat brands. 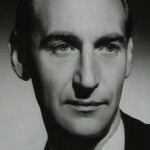 He wrote for Punch magazine, published as Mark Spade, and also wrote novels under his own name. During World War II he was a civil servant at the Ministry of Food, and then a successful scientific adviser, rising to the rank of brigadier. In 1956, he moved abroad to write screenplays in Hollywood and elsewhere, but was increasingly troubled by alcoholism, and returned to England in 1962. He died in 1970 at a nursing home in Hampstead, London, and is buried on the edge of the north path in Hampstead Cemetery in north London. His gravestone is small, but distinctive, having the form of an open book. As a screenwriter he worked on an early draft of Cleopatra but is principally remembered for The Man Who Never Was, for which he won the 1956 BAFTA Award for Best British Screenplay, and Mandy, the story of a deaf child. He also wrote the screenplay for The Singer Not the Song. Posted on September 21, 2015, in Darkness Falls from the Air, Nigel Balchin, The Small Back Room. Bookmark the permalink. Leave a comment.